The Rough Restaurant is open every weekend on Fridays and Saturday night for dinner and Saturday and Sunday for breakfast. Please note in low season, the restaurant is contingent upon bookings and occupancy so may be closed due to low numbers. Private dining and functions are available throughout the year for 12 guests and above. Bookings are essential. 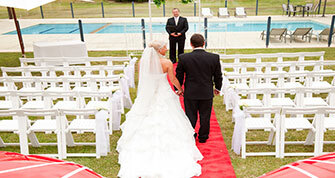 Contact our team to secure a booking info@barwonheadsresort.com.au or (03) 5254 1777. The Barwon Heads Resort Events Centre now provides private dining facilities for groups. The Centre is situated between two beautiful and exclusive landmark golf courses. In summer you can choose to sit back, relax and enjoy a gourmet meal overlooking the stunning crystal clear pool….or in winter enjoy a stunning meal and wine by the fireplace. 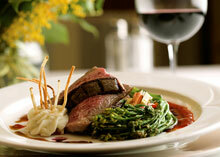 Our chefs source local produce to offer an ever-changing, delicious and seasonal menu for guests and visitors. For conferences, other events and for group dinners, the restaurant can be opened mid-week. We cater for all dietary requirements and can tailor a menu to suit.